Anna Eleanor Roosevelt was married to President Franklin D. Roosevelt and she was First Lady of the United States from 1933 to 1945. She became an influential personality during her husband's years in office. During Franklin D. Roosevelt's presidency , Eleanor dramatically changed the role of the First Lady . Eleanor gave press conferences and with her daily column she kept the public up-to-date on White House policies; in particular the "New Deal". As a humanitarian and civic leader, Eleanor spoke out for Human Rights, Women's Rights, and Children Issues. In addition, she also sought to help the country's poor and spoke against racial discrimination. 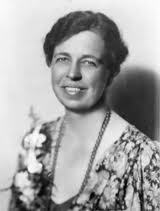 After her husband's death Eleanor Roosevelt continued to be an important and influential world figure. As a member of the United Nations' Commission on Human Rights, Eleanor's work on the Universal Declaration of Human Rights would become one of her greatest achievements. if they betray you twice, it’s your fault. For the person who is unwilling to grow up, the person who does not want to carry his own weight, this is a frightening prospect. You are able to say to yourself, I have lived through this horror. I can take the next thing that comes along. You must do the thing you think you cannot do. The influence you exert is through your own life, and what you've become yourself. Stick to your beliefs as they stick to theirs. Work as hard as they do. and which mean very little.